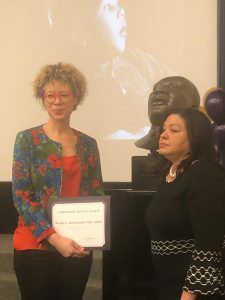 January 17, 2019 Seattle—UW Health Sciences and the UW Medical Center honored Wendy Barrington, PhD, MPH, Assistant Professor, Department of Psychosocial & Community Health, UW School of Nursing, with the Martin Luther King 2019 Community Service Award during the 20th anniversary celebration. Barrington has been working with community groups to facilitate access to services for marginalized groups. “Wendy is very deserving of this recognition as she brings a deep commitment to social justice. Specifically, she supports community-driven cancer screening promotion activities to address power asymmetries for improved patient and population health,” stated Azita Emami, PhD, MSN, RNT, RN, FAAN, and the Robert G. and Jean A. Reid Executive Dean of the UW School of Nursing. Through her efforts, Barrington has shifted the community health nursing track at the School by broadening its scope to focus on population health systems. This expanded scope, better prepares future nurses to integrate system-wide interventions rather than smaller community-health focused endeavors. The community service award honors individuals or groups who exemplify Martin Luther King, Jr.’s principles through a commitment to addressing community needs, particularly communities of color and low income; development and implementation of significant programs to improve the human condition; and outstanding efforts to protect and empower all individuals.